Northern Ireland has the lowest level of motorcycle theft in the UK (includes scooters and mopeds). 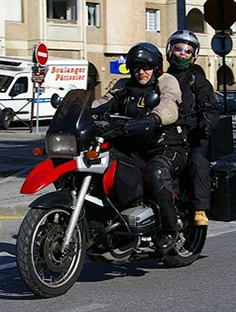 A study carried out by Carole Nash, is the most comprehensive annual study of its kind since the Home Office last published the Motorcycle Theft Survey in 2005. The study analysed over 230,000 claims from their customers and used this data to assess the biggest risk areas. North West London was named as the top spot for motorcycle theft in the UK, with residents here 5 times more likely to have their bike stolen compared with the country’s average. The safest region to live in regarding motorcycle theft was Northern Ireland, where owners are 6 times less likely to have their bike stolen than in London. Even if the statistics tells us that Norn Iron is the least likely place in the UK to get your bike stolen, it still helps to take advantage of security measures available, but beware, professional thieves can circumvent alarm systems and don’t care about any of the marking systems, because a professional will either ship the bike out of the country or the bike will be sold for parts, which can fetch ten times its value. Use a ground anchor, a strong chain and a reliable lock and if you have a garage, use it, if you can get your bike into your shed, do it, if you can’t do that, use a strong chain and wrap it around a lamp post or fence where there is lighting. Thieves will always look for the easiest and quickest option. Other methods such as an angry dog, wife/husband and/or witchcraft may help. 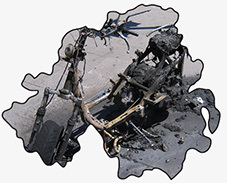 The bottom line is do your best to secure your bike, because if it does get stolen, the insurance companies will do their best to avoid paying out, either by finding an excuse not to pay or by increasing your premiums to such a degree that it’ll make you lose the will to live. Whatever you do, don’t lie to them i.e. don’t tell them you’ve got a garage if you haven’t, because they will check. According to the study, the Honda SCV100 lead scooter is the model most likely to be stolen. Scooters and mopeds showed a much higher risk of being stolen than other models infact the overwhelming number of thefts of bikes are and have always been these types, because they are easier to lift and generally owned by young people, who may not have the same opportunities to protect their bikes. The least likely style to be stolen was the tourer, 6 times less likely to be stolen than a scooter or moped.